Heat oven to 375°F. In 10-inch skillet, heat 1/2 inch water to boiling. Add asparagus; reduce heat to medium-low. Cover; simmer 2 to 3 minutes or until crisp-tender. Drain. Plunge asparagus into bowl of ice water to cool; drain on paper towels. On ungreased cookie sheet, unroll dough; press into 11x8-inch rectangle, firmly pressing perforations to seal. With fork, prick crust generously. Bake 6 to 9 minutes or until light golden brown. Sprinkle with 1/2 cup of the cheese; top with prosciutto strips. Sprinkle with remaining 1 cup cheese. 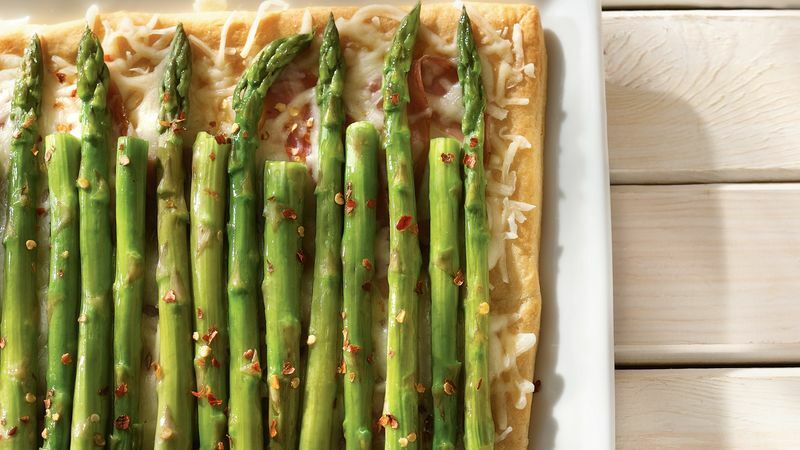 Arrange cooked asparagus spears in rows over cheese, alternating tips. Brush with oil; sprinkle with pepper flakes. Bake 5 to 7 minutes longer or until edges of crust are deep golden brown and cheese is melted. Cool 5 minutes. With serrated knife, cut into squares. Serve warm. Prosciutto is very thinly sliced. When you open the package, separate the paper-thin slices carefully. Experiment with other finely shredded cheeses like parmesan or Romano for a different flavor.